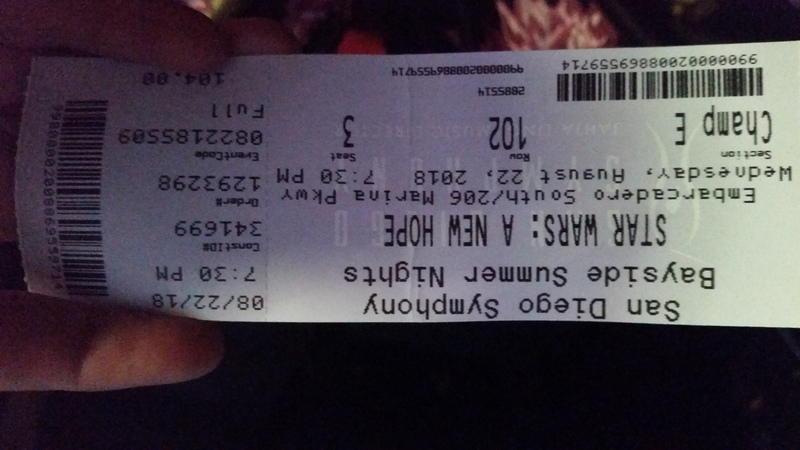 This week I was treated to an outdoor, live symphony in San Diego (at the Embarcadero Marina Park South, August 18, 2018) playing to a large screen-film showing of Star Wars: A New Hope. To say it was spellbinding would be an understatement. 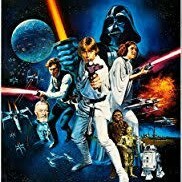 I haven’t seen A New Hope (just called Star Wars, back in the day) on the large screen since the original trilogy’s Special Editions came out in 1997. 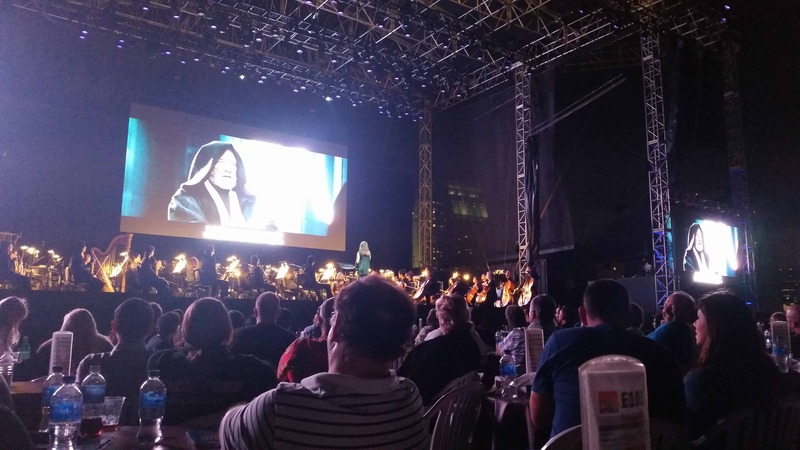 With the San Diego Symphony Bayside Nights offering monstrous screen outdoor movies set to a live orchestral soundtrack, people have started flocking to these events in droves. It was as packed last night as it was to their Harry Potter versions last year. And the Star Wars audience was surprisingly into the spirit of the story. Where did you dig UP this old fossil? It’s hard to describe how amazing it is to watch a beloved movie set to live music. When I could tear my eyes from the screen, I was impressed to see how many string instruments Williams’ score used. He was also heavy on the brass, and light on percussion…although when drums or other percussive instruments were used, they were to magical effect. Nothing sweeps you right along like the Star Wars theme. After the orchestra members took a bow, it was a matter of inching through the cattle-like foot gates, and waiting an hour to exit the car from the Downtown Hilton parking garage, during which my enthusiasm waned a bit (I recommend Uber for things like this). But John Williams’ iconic score still resounded in my brain. I considered what other movies could inspire enough audiences take the jump from ignoring a “boring” orchestral event, to packing the outdoor grandstand seats and champagne lawn tables for fine arts versions of pop culture immersion. The Harry Potter movies are a clear success in this format, with eight movies, plus the new Fantastic Beasts versions to choose from. And I suspect they can give it a go for the lineup of other Star Wars films. Other movie franchises with powerfully memorable scores include Indiana Jones, Jurassic Park, Superman, ET, and possibly Close Encounters. 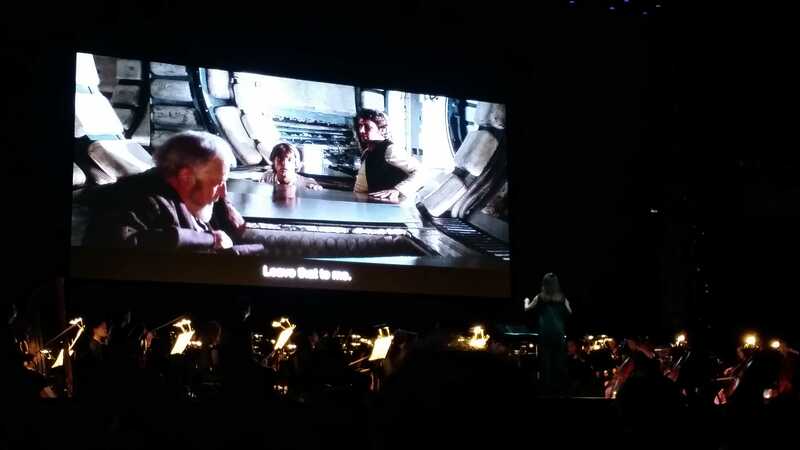 If I’m leaning heavily on John Williams films, that should be no kind of symphonic surprise. But there are certainly other composers lending themselves to this kind of treatment. Think about The Lord of the Rings saga or Titanic. If there are other movie franchises whose tune you can easily identify offhand, that’s a place to start. And if said movie comes with a fanatical following, well, there you go. I’m excited for the next time I can hit the symphony for a fabulous science fiction or fantasy film super-experience. It will have to be an annual event! As a re-watch, of course I give Star Wars an A+, film-wise. Seeing it on the large screen with a superb live orchestra takes the film to new heights. If there was a super-grade above A+ for the live musical option, I’d give it. Great seats. The Force was clearly with me that night! I didn’t even need to use my Peetimes; the event included an intermission. However, since everyone else in the audience used this intermission as well, clogging up the toilet lines, I should have checked the app anyway. We do have Peetimes for A New Hope listed in the RunPee app, even though RunPee didn’t remotely exist yet, as a sort of retro-cool flashback feature. For fun, you can scroll through the movies on the RunPee app, and peek at what we did. I can think of a few movies I’d like to see, make that ‘hear,’ get the live symphony treatment: Interstellar, Inception, Infinity War. But, if I had my choice of anything, I’d love to hear the Battlestar Galactica music by Bear McCreary, or the music from the video game Halo. I like your first three options, but I’m not sure they are symphonic enough. I’d have to listen again. Do you think the Matrix would be a good addition? Halo too. I’d do that. But on the large screen, it would besically be wathing someone play. They need to make The Halo Movie! Halo too. I’d see that. But on the large screen, it would basically be watching someone play. They need to make The Halo Movie!